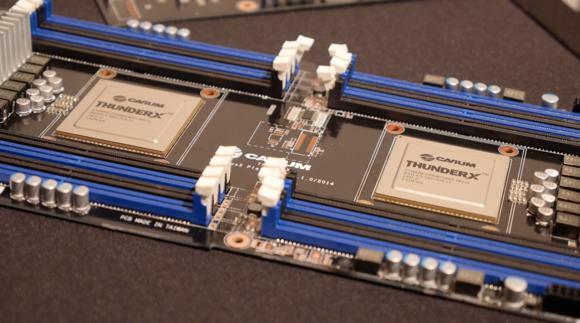 Semihalf, which is based in Poland, demonstrated a beta version of FreeBSD running on a server board built with Cavium's ThunderX processors. That's the first hardware based on ARM's 64-bit processors to run FreeBSD. FreeBSD is a flavor of the Unix OS developed by the University of California, Berkeley. The OS runs on a broad array of platforms. Low-power processors from ARM, which licenses chip designs, are mostly used in mobile devices. But the company is gaining ground in servers with its 64-bit ARM processors, and drawing interest for use in cloud and web hosting installations. Though not updated as frequently as Linux, the Unix-like nature of FreeBSD makes it a comparatively stable server OS distribution compared to some Linux-based alternatives, said Dean McCarron [CQ], principal analyst at Mercury Research. "[FreeBSD] takes a different approach to OS design. It is not as freewheeling as Linux," McCarron said. But FreeBSD lacks the elasticity of Linux, which supports more applications and hardware. Interest in ARM servers has been held back by software issues and chip delays. Microsoft has said it won't port Windows Server OS to ARM, so Linux remains the dominant OS. Wider OS support could mean more interest in ARM server chips. At the processor company's annual TechCon conference next week, two sessions are being held to discuss the development of FreeBSD for 64-bit ARM.